Easy, Healthy Recipes & Shopping Lists! Easy, Healthy Recipes & Shopping Lists!! This easy-to-use meal planning website takes the hassle out of planning and preparing family dinners. Choose from dozens of delicious, nutritious meals, all labeled with Weight Watchers Plus Points. Then, armed with weekly recipes and shopping lists, you’ll be better prepared to make smart food choices. Spend less time hunting down recipes or obscure ingredients—and more time enjoying dinner with your family! No sloppy casseroles or expensive kitchen blunders. Instead look for everyday food…with a gourmet twist. Developed by two busy moms, Relish! is an online meal planning service that simplifies the art of healthy eating for families. All meals are categorized for easy browsing. Choose from Kid-Friendly, Super Quick, Crockpot, Vegetarian and Simple Gourmet. 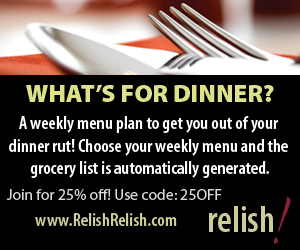 After you’ve chosen your meals, Relish! will provide weekly recipes and shopping lists to make meal preparation a breeze. I guess I’ll just sum it up what I wrote and say, I’m thorlughly enjoying your blog.